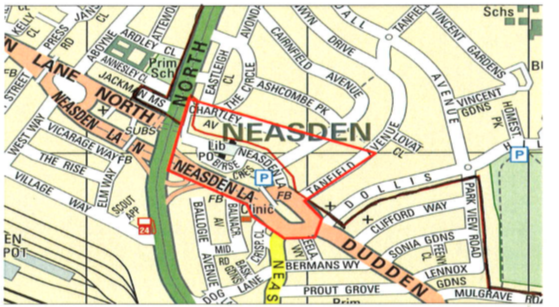 A Public Space Protection Order (PSPO) is now live in Neasden. The Government’s street drinking laws were time limited and have now expired so the Council has implemented it’s own PSPO in partnership with the Police to clamp down on street drinking. The purpose of the PSPO is to help tackle and address the issues of street drinking which is taking place within the Neasden Shopping Centre area. The area outlined in blue is covered by the PSPO. Sadiq Khan has delivered on the Night Tube for Dudden Hill residents. The ward is well served by the Jubilee Line with residents using Willesden Green, Dollis Hill and Neasden Stations. Starting from tonight, Tube services will now run on Friday and Saturday nights on the full length of the Jubilee line from Stanmore to Stratford. We have been busy working with the Church and Daniel’s Estate Agent to put together this community festival event. We have stage performances lined up for the day and stalls so feel free to come along and celebrate with us. This event is being supported by Daniels Estate Agents and has been organised by St Catherine’s Church, the regeneration team at Brent Council and Dudden Hill Labour Councillors. Christmas Day – Controlled Parking Zones will not be enforced, although please take care not to park on yellow lines during their operational hours or block residential driveways. Boxing Day – Controlled Parking Zones will be enforced in zones E, T, W, KG, KM, KR only. To support shoppers and local retailers, free parking will be made available in some of the Brent Council run car parks on the weekends before Christmas. The call centre is not open on Christmas Day, Boxing Day, or New Years Day. Only a handful of Controlled Parking Zones are operational on bank holidays, and none operate on Christmas Day. Please access our parking services online for permits and visitor parking. You can also book visitor parking by SMS. The individuals are known to be patrolling around in a car and approaching Asians. One of my constituents was lured at the Neasden Shopping Centre by being asked directions to the temple as a conversation starter. Thankfully she was having none of it and went away! I have raised the issue with the Police Safer Neighbourhood Team who are on the lookout for these criminals. It is important that all incidents are reported to 999 in an emergency and 101 in non emergency situations. In 2010, one of our first major campaign victories was the traffic measures we introduced on Tanfield Avenue. Residents were victim to buses and large vehicles hitting their cars. Liberal Democrat Councillors knew about this and took zero action. They only come around at election time in Dudden Hill. We called on TfL and Brent Council to look at the option of allowing cars to park on the road and part on the pavement before we were actually elected. We were successful in our argument and won funding to pay for pavements with lower kerbs to allow this to happen. You always remember your first major campaign victory and this was still remembered by residents living on the road when we visit them.